Photo: Local MSP Tricia Marwick meets the Fairy Flag cast. A film billing itself as the biggest independent Scottish film for 20 years has just finished filming some scenes in Fife. The Fairy Flag tells the story of a Scottish legend involving the Clan McLeod from Dunvegan Castle on Skye and the enchanted flag, passed down through the generations that is said to have been a gift from the Fairy queen Titania. It is said to have brought the Clan luck in battle and to have many and varied magical properties. The film, an epic romance starring ex-model Chris Capaldi (Iain Breac MacLeod) and Jade Yourell (Titania) has many scenes filmed in Fife, with Balgonie Castle near Milton of Balgonie standing in for Dunvegan Castle. 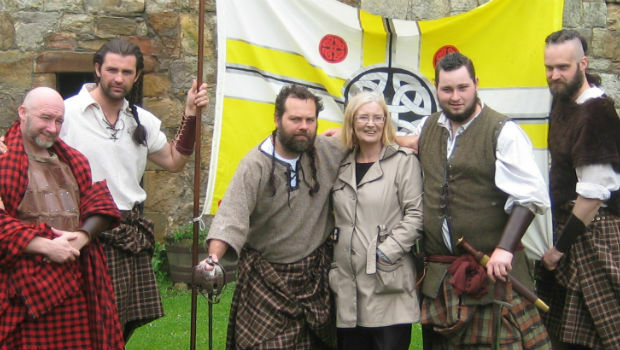 Former Pop Idol star Michelle McManus has one of the few modern-day roles in the film, as a tour guide showing tourists around Dunvegan Castle. Comedian Ross Noble has also been offered a cameo after visiting the cast and crew unexpectedly on set. There are also strong Fife links, Director Dave Izatt isf rom Dunfermline, many of the crew also come from the Kingdom and Fife’s own Lord Provost, Jim Leishman will have a cameo in the film.